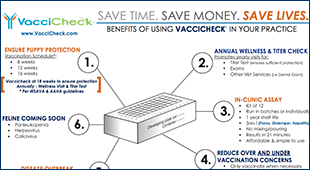 VacciCheck® Antibody Test Kit is a simple and affordable in-clinic titer test designed for determining protective immunity in the puppy, for informing revaccination intervals in adult dogs and in management of infectious disease outbreaks in shelters1. VacciCheck provides reliable and accurate results in just 21 minutes! Serology testing is useful after a dog vaccination to indicate antibody levels for the core canine vaccines. In this way the veterinarian can modify vaccine programs for individual puppies. The cut-off values of the VacciCheck kits correlate with the vaccination recommendations of the Cornell University School of Veterinary Medicine. The developing plate has multiple compartments, which contain the necessary reagents for comb developments. 1. Obtain blood or serum from animal(s). Just 5 µL serum or 10 µL blood. 2. Deposit blood or serum sample(s) into well(s) A in developing plate. 3. Insert Comb into well(s) A. Incubate for specified time. 4. Transfer the Comb from well(s) A to well(s) F in a timed sequence. Time intervals vary according to type of kit. 5. Let Comb dry and read results. 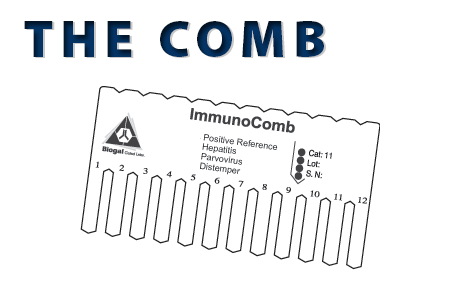 The color intensity of spots on Comb corresponds to antibody level. Featured in Dogs Naturally Magazine, Catherine O’Driscoll, founder of Pet Welfare Alliance, an organization that brings together animal advocates and pet owners from around the world, discusses VacciCheck and the benefits of titer testing rather than immediate vacciantion. Dr. Karen Becker looks into why 60% of vets are still doing annual re-vaccination despite the now 2-year old guidelines that contradict this practice. A report by Shawn Messonnier, DVM on how he has successfully implement titer testing in his practice with the use of VacciCheck. A peer reviewed report by Richard B. Ford, DVM, MS, Diplomate ACVIM & ACVPM (Hon) on the benefits of titer testing with the availability of in clinic tests like VacciCheck. A featured article in Dogs Today May 2012 edition by Richard Allport who runs a large referral center in Hertfordshire, offering a range of natural therapies for pets, including homeopathy, herbal medicine, acupuncture and healing. The Chicago Tribune’s My Pet World by Steve Dale looks at the potential dangers, and risks associated with over-vaccination in animals. Several controversial issues are discussed in the 2011 American Animal Hospital Association (AAHA) Vaccination Guidelines. A brief 3 minute animated video explaining how and when it appropriate to utilize VacciCheck in your practice. Dr. Ron Schultz, Professor and Chair of the Department of Pathobiological Sciences at the University of Wisconsin School of Veterinary Medicine and his assistant Bliss Thiel demonstrate how to run the Canine VacciCheck antibody test. Brought to you by Maddie’s Fund. Dr. Richard Ford, DVM, MS, DACVIM, DACVPM speaks at the 2015 NAVC to a large audience about the vital vaccination series and importance of titer testing. Dr. Annette Litster, Director of Maddie’s Shelter Medicine Program at Purdue University, talks about the use of antibody titer tests in animal shelters. Brought to you by Maddie’s Fund. Dr. Ron Schultz, Professor and Chair of the Department of Pathobiological Sciences at the University of Wisconsin School of Veterinary Medicine and his assistant Bliss Thiel demonstrate how to interpret the Canine VacciCheck antibody results. Brought to you by Maddie’s Fund. 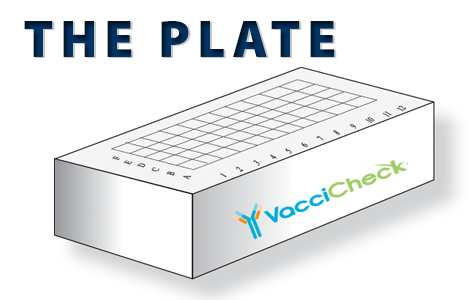 VacciCheck manufacturer Biogal Galed goes over everything you need to know about using their ImmunoComb product to obtain quick and easy titer results in just 21 minutes! Interactive webinar from March 18, 2014 with Dr. Patrick Mahaney MVD. We discuss the various ways in which he has been able to successfully implement titer testing into his practice to avoid Vaccinosis and other dangerous side effects of over and under vaccination. Learn when titer testing is appropriate, why it is necessary, and how you can make it standard practice in your clinic. PAWS Radio Vet Pet (09-01-2013) Our very own Lyndee Kelver joins Dr. Randy for PAWS Radio Vet Pet to talk about VacciCheck and callers share their own personal experiences with vaccinations. Listen below or click here to visit PAWS Radio Vet Pet online. Cat Chat® & Dog Talk® (05-28-2013) The Vaccicheck show! Dr. Ron Schulz calls to explain about the deadly CORE diseases, why puppy shots are so vital and why the blood titer test Vaccicheck is so valuable for puppies and geriatric dogs — like Rebecca’s, who calls from SO. California about whether to vaccinate her aging pooch with a foot tumor. Listen below or click here for more from the Radio Pet Lady Network.